by dozens of small inlets, is about seventy miles long. Its waters are fed by springs and small mountain streams spread over a watershed of about 62 square miles. The depth varies from eighty-five feet at the dam to zero at the headwaters, and its volume is sufficient to supply energy to operate two turbines with an output of 18,000 kilowatts. The lake was made available to the public for recreational uses in 1925. 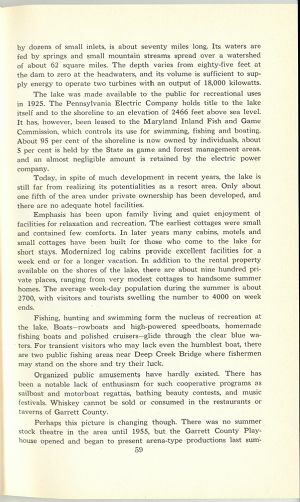 The Pennsylvania Electric Company holds title to the lake itself and to the shoreline to an elevation of 2466 feet above sea level. It has, however, been leased to the Maryland Inland Fish and Game Commission, which controls its use for swimming, fishing and boating. About 95 per cent of the shoreline is now owned by individuals, about 5 per cent is held by the State as game and forest management areas, and an almost negligible amount is retained by the electric power company. Today, in spite of much development in recent years, the lake is still far from realizing; its potentialities as a resort area. Only about one fifth of the area under private ownership has been developed, and there are no adequate hotel facilities. Emphasis has been upon family living and quiet enjoyment of facilities for relaxation and recreation. The earliest cottages were small and contained few comforts. In later years many cabins, motels and small cottages have been built for those who come to the lake for short stays. Modernized log cabins provide excellent facilities for a week end or for a longer vacation. In addition to the rental property available on the shores of the lake, there are about nine hundred private places, ranging from very modest cottages to handsome summer homes. The average week-day population during the summer is about 2700, with visitors and tourists swelling the number to 4000 on week ends. Fishing, hunting and swimming form the nucleus of recreation at the lake. Boats—rowboats and high-powered speedboats, homemade fishing boats and polished cruisers—glide through the clear blue waters. For transient visitors who may lack even the humblest boat, there are two public fishing areas near Deep Creek Bridge where fishermen may stand on the shore and try their luck. Organized public amusements have hardly existed. There has been a notable lack of enthusiasm for such cooperative programs as sailboat and motorboat regattas, bathing beauty contests, and music festivals. Whiskey cannot be sold or consumed in the restaurants or taverns of Garrett County.